This is another most important design pattern and this is the foundation of Spring, Struts and most of frameworks. Specially this is mostly used in JDK also. The main advantage of using this method is to hide implementation details from the user. Actually this design pattern is developed using Encapsulation concept. It decouples calling from target class. 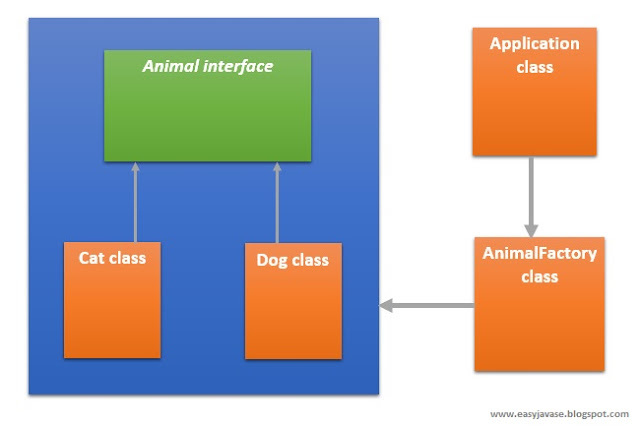 Look at the following class diagram and example to understand about Factory design pattern. Look at this example with above diagram. In this example I want to create a cat instance. Then you will be able to see it creates a new Cat object. If you want a Dog object, you need to set animalType to dog. Then it will create a new Dog object. According to the user requirement, system will produce the requested abject. This is the core concept behind Spring and Struts frameworks. You may know that there is a concept behind Spring framework called "Dependency Injection". To make it loosely coupled, it uses this factory design pattern inside the framework. This is another core interface in java collection hierarchy. Special thing is Set cannot contain duplicates. Set has three main implements. HashSet is the fastest set implementation, TreeSet is slowest one. HashSet doesn't maintain a order. 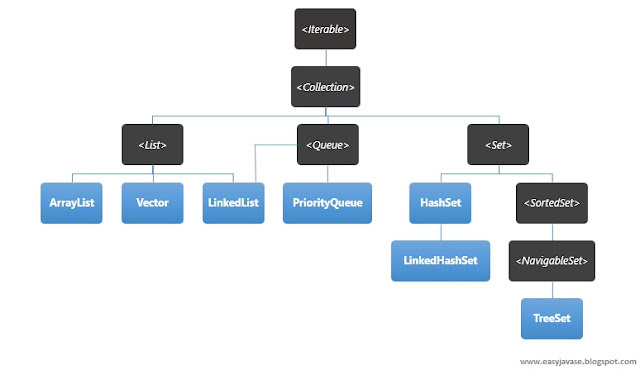 But LinkedHashSet maintain insertion order while TreeSet maintain sorted order because it implements sortedSet interface. 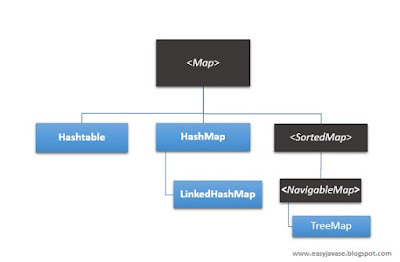 Both HashSet and LinkedHashSet allow null values but TreeSet doesn't allow null values. LinkedHashSet was introduced in 1.4 version in Java. Look at the following example to understand about Treeset. 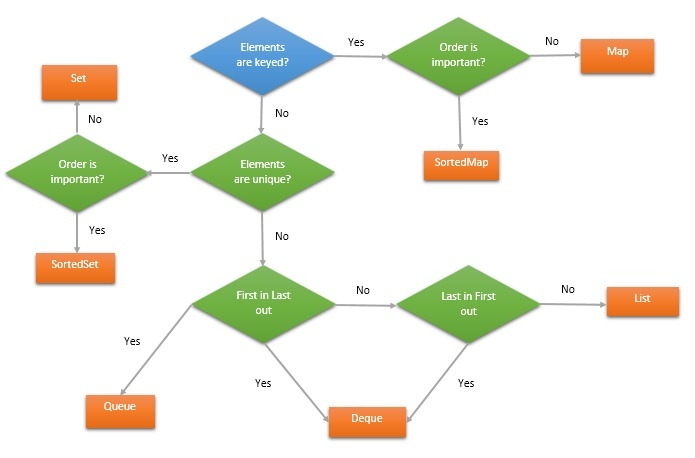 It shows about sorting of TreeSet. Look at the following example to get a brief idea about set interface. Look at the following example to get an idea about the things that you can do with sets. Following example shows to get distinct characters. In my first post of collection you may have an idea about, how to choose a collection. In this post I'm gonna talk about List interface. List interface can be used if you need an ordered collection which can also have duplicates. There are four special classes which implement List interface. Implemented by using a re-sizable array (Dynamic array). ArrayList is not synchronized . Default initial capacity is very small. Once it is filled its size will be incremented by 50%. It allows random access and it is fast. But Inserting and deleting is slow. This uses iterator to traverse. LinkedList allows sequential access and it slow, but inserting and deleting is fast. LinkedList doesn't have initial size. Compare to ArrayList and Vector, LinkedLIst uses more memory. Vector looks same as ArrayList. Main difference is, Vector is synchronized. Accessibility is slow, because Vector is synchronized. Once it is filled, initial capacity is incremented by 100%. Vector uses Enumeration to traverse. This is another simple class which is extended to Vector class. Stack is Last In First Out (LIFO) manner collection. Stack is also synchronized just like Vector, then Stack is also slow. Stack has few special methods, push(), pop() and peek(). Look at the following example about simple operations of Stack. Vector and Stack was introduced in 1.0 version while ArrayList, LinkedList and Collection was introduced in 1.2 version of Java. Because of that, Vector and Stack is called "legacy classes". You may look at the following example to get an idea about List interface. This example is done by using ArrayList and it can be implemented by using LinkedList and also using a Vector. Iterator can be used to traverse on ArrayList and LinkedList. You can also use loops to traverse. This is very important when talking about ArrayList and Vector classes. These two classes implements RandomAccess interface. RandomAccess interface is a Marker interface like Serializable and Cloneable interfaces. There is no methods present in these marker interfaces. These interfaces identify classes with the capability of they are defined. Now you know both ArrayList and Vector classes implement RandomAccess interface. So when you searching and accessing any data inside of ArrayList or Vector, it is too fast than others. Collection interface is the core interface of List, Queue and Set. It consist of core operations that can be used to work with above interfaces. You may look at the following example which is done using List interface. I think now you have a basic idea of using Collection interface. There are three main ways to traverse on a collection. Third concept is a new one which is introduced after Java 8. At the moment I skip it and looking through first and second ways. Look at the following example. This is another important thing when you think about Collection interface. I think you may heard about serialization. Serialization is the process of convert the object into byte stream. Why we need to do this ? This is very important for collection framework. Each and every collection class implements Serializable interface by default. This is another important interface which each and every Collection classes are implemented. Cloneable interface is used to get a exact clone of objects for future needs. Just think once you got a list of objects, you want to manage it. While you are doing this, sometimes objects may be lost. At the time you'll have to get that list of objects again from the source. But you don't need to worry about this, because every Collection class is implemented Cloneable interface and it can be easily get the same set of objects again. Queue is another interface which implements Collection interface. This follows First In First Out (FIFO) manner in implementation. This interface has some special methods that can be used to work with it. A queue can be implemented as follows. Special thing is, a queue which is implemented using Java concurrent package are bounded, others are unbounded. LinkedList is a better approach to implement a queue. Look at the following code to have an idea about queue. If you use a LinkedList to implement a queue, then specially you can add null values also. But it your are using a PriorityQueue, you cannot add null values. There are some special methods that can be used with a queue. Look at the following methods and at the bottom you can see an example using these methods. Both methods can be used to add elements to the queue. But in PriorityQueue, you cannot add null values. It will throw NulPointerException. But you can add null values in LinkedList implementation of queue. Main difference can be seen when it happens any error while adding(Capacity exceeding). At the time add() method throws IllegalStateException but offer() method returns false. Both methods are used to return the head and remove it. If queue is empty, remove() method throws NoSuchElementException but poll() method returns null. Both methods are used to return the head of the queue. If queue is empty element() methods throws NoSuchElementException but peek() method returns null. Look at the following code which is implemented using a PriorityQueue for a complete reference. Collection, this may be another most advanced section in Java. I think you may heard that there are so many things to learn about Collections. Lets begin our journey. What is the Collection & Collection framework ? Collection is a just a collection of objects or data. Java collection framework is a architecture which is used to manage collections in Java. Java Collection framework is consist of interfaces, implementations and also algorithms. As you can see, Map is a separate collection interface. Because it stores values with a key. How to select which Collection is needed ? Collection hierarchy is a big one, but you can identify it easily. Look at the following diagram. Begin with the blue color checking statement. Collection is a interface and it is the root interface of Java Collection framework. Coillections is a utility class which is from java.util package. 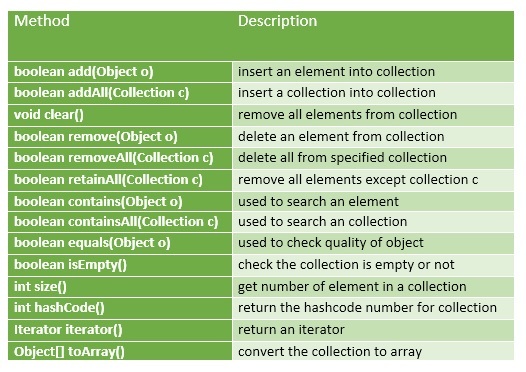 Collections class consist of core methods that can be used commonly with List, Set and Queue. There are so many methods which are defined in Collections class. No need to learn new APIs or create new APIs. What does it mean by nested class ? A class within another class called nested classes. You can define one class within another class as follows. What is the purpose of using nested class ? To improve code readability and maintainability. This is the way of grouping classes where all classes are used in one place. To improve code optimization (By increasing encapsulation). This can be used to hide implementation details. If you create a static class inside of any class is called static nested class. These are called "Top level inner classes". It can access any data of outer class including which are with private access. It can't access to non-static data. If you create a non static class inside a class but outside of a method is called inner classes. As you can see in above diagram, there are two types of inner classes. 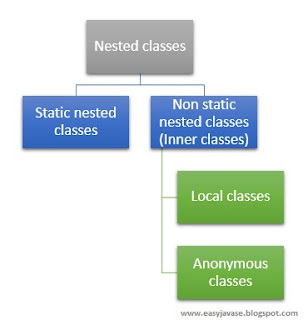 A class which is created inside of a method is called local inner classes. You may look at the following example. This looks same as local inner classes, but anonymous inner classes don't have a class name. Using anonymous classes, you can declare and instantiate a class at the same time. Anonymous classes can be used to concise your code and make it more readable. Anonymous classes can be created using two ways. You may need to consider about following things when you create anonymous classes. You have to extend to a class or implement by using a interface. You need to use "new". Anonymous class is just like a expression. You can create local classes and methods in anonymous classes. But you can't create constructors in anonymous classes. Inner classes are really useful when creating GUI applications. Think, you just want to make an ActionListener when you click on a button. Once you get it you may think to do it as follows. But unfortunately you forgot that you cannot create objects without implementing to ActionLesterner interface. Then the easiest way to do it, using inner classes. What are the main features of Java ? Before Java, "C" is the most powerful language. If you have worked with C, you may feel it is complex than Java and also it is not a Object Oriented programming language. C is Structured oriented language. When Java is invented, is it very easy to understand. Because Java is less complex than C and other languages and it is easy to learn. Java is highly strong programming language. Why I'm saying Java is Robust ? Really Java provide both compile time and run time error checking mechanism. It means there are two error checking gates to ensure your code is correct. If you have any idea about C language, you may know, C is widely using pointers. But Java doesn't use pointers, it has References. Java is using new keyword to make object. That new returns a reference, not a pointer. Platform is a hardware and software combination to run a program. For example Windows, Linux, MacOS. But Java is a software only platform, it means Java can be run in any hardware. Java platform is a combination of two components. In my next post I'm gonna talk about JVM architecture. So I skip in this moment. Java API is a set of predefined large collection of ready made software components that can be used when creating Java applications. Java is really built for high performance application creation. Java is running on virtual machine(JVM). You may feel it makes slow execution than native code. But Java's high performance Virtual Machine and compiler gives same performance like native. Multi-threading and OOP concepts are described in previous posts. So I skip them for a moment. Which languages are used in Java ?